There may be eight candidates in the running for the presidency in Chile, but the race to replace socialist president Michelle Bachelet has been rather sluggish. 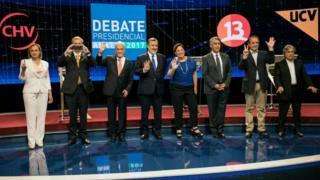 Not only does the frontrunner, billionaire businessman Sebastián Piñera, have a wide lead over all the other candidates, he is also a known quantity, having already governed the country from 2010 to 2014. Nevertheless, Chile’s presidential poll on Sunday is being closely watched in the region to see if it results in another loss for left-wing parties in Latin America. A decade ago, Argentina, Bolivia, Brazil, Chile, Cuba, Ecuador, Honduras, Nicaragua, Uruguay and Venezuela were all governed by left-wing leaders. But in recent years, conservatives have come to power in Argentina, Brazil and Paraguay, and Venezuela’s “Bolivarian Revolution” has come under severe pressure with anti-government protesters taking to the streets for months . A win by Mr Piñera and his Chile Vamos coalition would further consolidate that trend. How likely is a rightward swing? Opinion polls suggest Mr Piñera will be ahead by a considerable margin in the first round on 19 November but that he may well fall short of the 50% required to win outright. This means a run-off, scheduled for 17 December, is likely. Sebastián Piñera governed Chile from 2010 to 2014, but will he win another term? Under Chile’s constitution, incumbent Michelle Bachelet is not allowed to stand again, as presidents are not allowed to serve consecutive terms. Her centre-left Nueva Mayoria (New Majority) coalition has endorsed senator Alejandro Guillier. But so far Mr Guillier, a former journalist and news anchor, has struggled to gain ground on Mr Piñera while the latter has benefited from deep splits in the Chilean left to cruise to the front of the polls. Third in the running is Beatriz Sánchez, a political newcomer representing the left-wing Frente Amplio (Broad Front) alliance. While some polls give Mr Piñera a 20-point lead over Mr Guillier, the polls also suggest that a second round could be much closer, especially if left-wing voters unite behind one candidate. A right-wing swing in Chile is therefore not a given but the constant attacks on Mr Guillier from his left-wing rivals during the campaign and the electorate’s apparent discontent with the Bachelet administration present the centre-left candidate with an uphill challenge. Mr Piñera has promised to rein in reforms brought in by Michelle Bachelet, saying he will halt the expansion of free university education and make modifications to pensions and taxes. Mr Guillier, on the other hand, has campaigned on the back of President Bachelet’s legacy, vowing to boost regional investment and shore up the welfare state. Beatriz Sánchez says she wants to distribute Chile’s riches. She proposes raising taxes and providing free education. Is President Bachelet’s legacy on the line? While President Bachelet’s progressive agenda has won plaudits abroad, her popularity plummeted during her second term, due in part to a 2015 corruption scandal involving her daughter-in-law. This year, however, the president overcame conservative opposition to successfully ease Chile’s strict anti-abortion laws. Conservative critics say Ms Bachelet pushed her reforms too far, while some voices on the left accuse her of losing touch with the people. Even Mr Guillier, who is endorsed by Ms Bachelet’s coalition, says Chileans are demanding “real change” and “reforms that reach regular people”. What is in store for the winner? Both Mr Piñera and Mr Guillier say that if elected, they will diversify external trade to ease Chile’s dependency on its main export, copper. Economic growth in Chile is lagging behind that of other Latin American nations and analysts say a future dip in copper prices could cause problems for whoever comes to power. Tensions with indigenous communities in the southern Araucania region could also cause headaches for the incoming president, with reports of unrest on the rise. What could it mean for the region? The Bachelet administration stepped up its role in the Venezuelan political crisis recently by offering asylum to Venezuelan opposition figures. A victory for the right in Chile would only deepen the rift between the two countries. Likewise, Chile’s growing impatience with Bolivian leader Evo Morales would certainly solidify under Mr Piñera’s leadership. On the other hand, relations with Argentina would likely become closer under Mr Piñera as he has often expressed his admiration for the Argentine leader, Mauricio Macri. Further afield, Chile’s economic dependence on China and the United States suggests a pragmatic foreign policy approach. A newly-signed update to Chile’s free trade deal with China, as well as the former’s presence in the Trans-Pacific Partnership, mean any incoming president will likely continue looking to Asia for much of the country’s trade.